Next step is to get the boat shotblasted to remove as much rust as possible. However the deal is that as soon as you do this, you have to stick a shop primer on it to stop the rust creeping back. But what kind of paint was required? There are tonnes of primers, marine and other kinds and not all work with other paints. And once you have put the wrong thing on, it is a complete bugger to get off. Lots of conflicting advice in what works in and out the water. In these situations of complete dilemma, I would normally defer to the mothership. 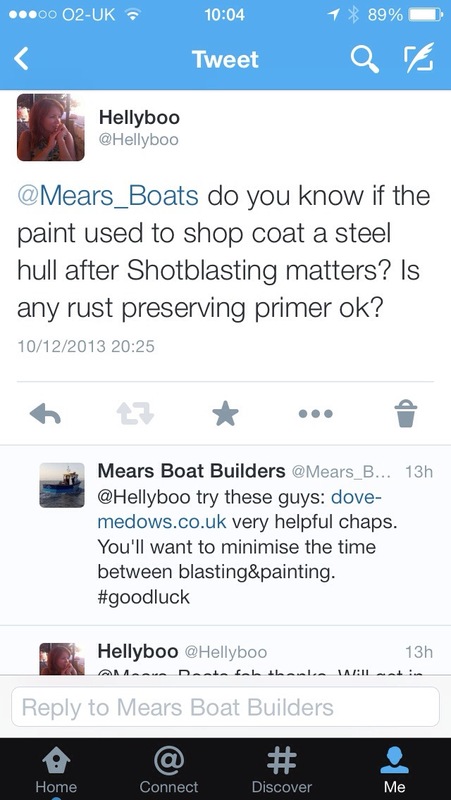 She has many talents (many ironing-based) but marine paint is not in her area of expertise. The second solution was to “ask twitter”. I had witnesses (as a twitter lurker) people find restaurants and teddies, and mend boilers all by the power of twitter. Never met this guy before, he builds beautiful wooden boats in Devon. What a hero. I call up Dove this morning, have a long and very helpful consultation with the guy there and now the paint is arriving on site first thing tomorrow. This entry was posted in Uncategorized on December 11, 2013 by hellyboo.